From the back cover: "In this remarkable debut novel, a boy's bittersweet passage to maturity and sexual awakening is set against escalating political tensions in Sri Lanka, during the seven years leadind up to the 1983 riots. Arjie Chelvaratnam is a Tamil boy growing up in an extended family in Columbo. It is through his eyes that the story unfolds and we meet a delightful, sometimes eccentric cast of characters. Arjie's journey from the luminous simplicity of childhood days into the more intricately shaded world of adults - with its secrets, its injustices, and its capacity for violence - is a memorable one, as time and time again the true longings of the human heart are held against the way things are." This was an excellent novel which combined the story of a boy and his family with the political happenings around them. It is an example once again of how the political and economic environment of a country has such an impact on a person's life. A well-written novel which was a winner of the SmithBooks/Books in Canada First Novel award and the Lamda Literary award for Best Gay Men's Fiction. This book is now on its way to someone as a RABCK, since it was on her wishlist. Enjoy! Thanks for sending, I had picked this out of a bookbox that I have at home this week - so I've kept your copy and sent the other off with the box, look forward to getting to soon. Set in Sri Lanka this coming of age novel tells Anjie's story. At seven he loves playing with the girls, always the lead role in Bride-Bride their fantasy game. He loves dressing up in Saris and being made much of, until the da that he is revealed to the adults in all his glory. His father quickly blames his mother and declares if he turns out a 'funny boy' it will be all her doing. We then follow Anjie through his childhood, much of which is dominated by the Tamil/Sinhalese conflicts. He watches family friends torn from lovers, beaten for their race, and the riots spill out. He also faces being Tamil, in school and at home, but only speaking Sinhalese as his parents desperately try to give their children a chance to make something of themselves in this country of seperation. The politics and his identity, both sexual and social and mingled side by side in the novel which deals with serious issues but is a great read. As Anjie grows older the tone of the novel becomes more serious as he begins to understand the world around him. I'll certainly be checking out more of Selvadurai's novels in the future. Reserved to travel to Soffitta1 as part of the Asian VBB. Thanks, this looks really interesting. TBR and passed on through Apoloniax's South Asia's VBB. 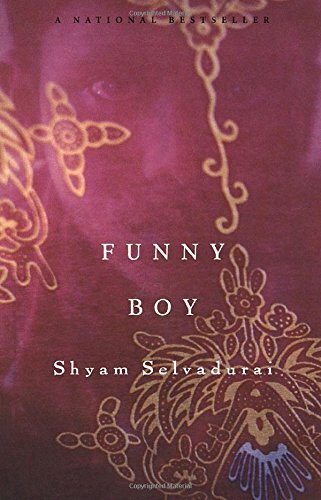 Set in Sri Lanka, this is a series of events in a young boy's life, looking at politics, race relations and sexuality. At the start of the book, Arjie is very young, so is often overlooked by those around him, so he makes a great observer, though we as the reader often can connect the dots quicker than him as a narrator. Through Arjie and his extended family, we get a real insider's view on life in Colombo in the late 70s and early 80s, told in hindsight, but from what he saw: Radha Aunty falling in love with a Sinhalese man, the return from Australia of a journalist Daryl Uncle (his Amma's former boyfriend), the arrival of Jeganm the son of his father's childhood friend. However, we cannot forget Arjie and this important stage in his life, from child to adholescent. In the first chapter, we see a young boy preferring to play with the girls rather than the boys, being called "funny" by his family, as they see his sexuality before he understands it. Through the book, we see him struggling to understand his sexuality, as well as his ethnicity as a Sinhalese-speaking Tamil and his position in the family. For me, this was a really good book to get a look at Sri Lanka, we all see the news with reports of the Tamil Tigers, bombs in Colombo, but this book helped me understand the situation a bit more and inspired me to find out more. Next off to tsjara as part of ApoloniaX's South Asian VBB Vol II.